Although cytotoxicity of inorganic metals has been well investigated, little is known about the cytotoxicity of organic-inorganic hybrid molecules. The cytotoxicity of zinc complexes was evaluated using a culture system of vascular endothelial cells. 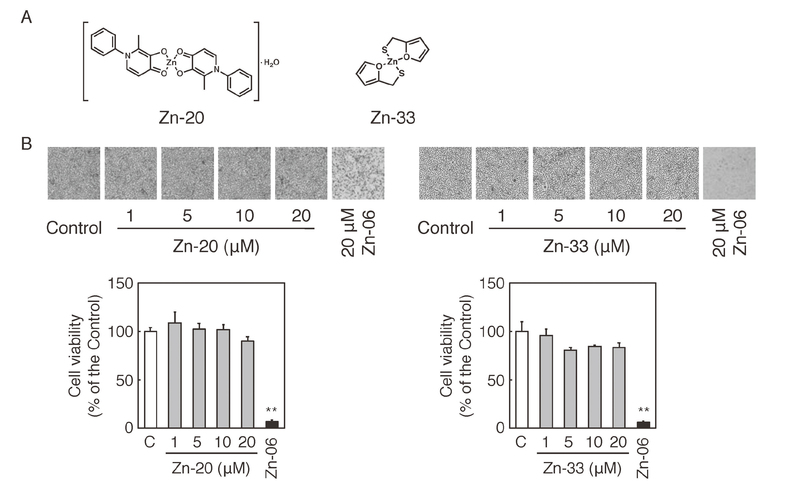 We found that bis(1,4-dihydro-2-methyl-1-phenyl-4-thioxo-3-pyridiolato)zinc(II), termed Zn-06, exhibited strong cytotoxicity in vascular smooth muscle cells, epithelial cells, fibroblastic cells, and vascular endothelial cells. This study showed that the tetracoordinate structure of the Zn-06 molecule, which contains two sulfur and two oxygen atoms attached to the zinc atom, facilitated its accumulation within vascular endothelial cells whereas the whole structure of the zinc complex was involved in its cytotoxicity in the cells. The present data suggest that a part of the structure, especially the binding site of the metal atom, was responsible for accumulation of zinc complexes, and the entire structure is responsible for their cytotoxicity in vascular endothelial cells. Vascular endothelial cells are a unique cell type that have direct contact with blood and regulate the blood coagulation-fibrinolytic system by synthesizing and secreting biological molecules such as von Willebrand factor (de Groot et al., 1984). Other such molecules include prostacyclin that inhibits platelet aggregation (Revtyak et al., 1987), heparan sulfate proteoglycans that activate antithrombin III (Marcum et al., 1986), plasminogen activators that convert plasminogen to plasmin (Levin and Loskutoff, 1982), and plasminogen activator inhibitor type 1 (van Mourik et al., 1984). Additionally, these cells function as a barrier between blood and subendothelial matrix. If this function is impaired, subendothelial collagen may induce platelet aggregation (Matsuoka et al., 1989) with subsequent intravascular blood coagulation. When endothelial monolayer is severely or repeatedly damaged, migration and proliferation of vascular endothelial cells near the damaged site are stimulated by fibroblast growth factor-2 (FGF-2) that leaked from the damaged endothelial cells to repair the monolayer (Sato and Rifkin, 1988). We have studied the effects of zinc on the functions of vascular endothelial cells and found that zinc stimulates their proliferation (Kaji et al., 1994) and promotes the repair process of wounded monolayers of the cells (Kaji et al., 1995) depending on endogenous FGF-2. These results suggest that inorganic zinc plays an important role in the regulation of vascular endothelial cell functions; however, little is known about the effects of zinc-containing compounds such as zinc complexes on vascular endothelial cells. Recently, we have proposed bio-organometallics, a research strategy in biology that uses organic-inorganic hybrid molecules, as a tool to analyze biological systems (Fujie et al., 2016a). This research strategy succeeded in revealing the intracellular signal transduction of metallothionein induction (Fujie et al., 2016b) and that of syndecan-4 expression (Hara et al., 2017) in vascular endothelial cells. On the other hand, the strategy showed that cytotoxicity of organic-inorganic hybrid molecules is different from that of either intramolecular metal in an inorganic form or the ligand (Kohri et al., 2015; Nakamura et al., 2017; Hara et al., 2018). Inorganic zinc is non-toxic in vascular endothelial cells (Kaji et al., 1992). In the present study, we evaluated the cytotoxicity of twenty-six zinc complexes using a culture system of bovine aortic endothelial cells. Bovine aortic endothelial cells and smooth muscle cells were purchased from Cell Applications (San Diego, CA, USA). Epithelial LLC-PK1 cells derived from porcine kidney and fibroblastic IMR-90 cells derived from human fetal lung were purchased from DS Pharma Biomedical (Osaka, Japan). The zinc complexes used in this study were supplied by Takehiro Nakamura, a research associate at Kindai University, Osaka, Japan. The following materials were purchased from the respective vendors: Dulbecco’s modified Eagle’s medium (DMEM) and calcium- and magnesium free-phosphate buffered saline (CMF-PBS) from Nissui Pharmaceutical (Tokyo, Japan); fetal bovine serum from Thermo Fisher Scientific (Waltham, MA, USA); and tissue culture plates and dishes from AGC Techno Glass (Shizuoka, Japan). Other materials include CytoTox 96 Non-Radioactive Cytotoxicity Assay, a lactate dehydrogenase kit, from Promega (Madison, WI, USA); May-Grünwald and Giemsa stain solution from Merck KGaA (Darmstadt, Germany); AlamarBlue, a cell viability assay reagent from Bio-Rad Laboratories (Hercules, CA, USA); 3,5-diaminobenzoic acid from Tokyo Chemical Industry (Tokyo, Japan); nitric oxide and other reagents from Nacalai Tesque (Kyoto, Japan). Vascular endothelial cells, vascular smooth muscle cells, porcine kidney epithelial LLC-PK1 cells, and human lung fibroblastic IMR-90 cells were cultured in DMEM supplemented with 10% fetal bovine serum in 24-well plates at 37°C and 5% CO2 until confluence. The media were discarded, and the cells were washed twice with serum-free DMEM. The cells were treated with each of the zinc complexes (1, 5, 10, and 20 μM) at 37°C for 24 hr in serum-free DMEM in 24- or 6-well culture plates. After a 24-hr incubation of the four cell types described above in 24-well culture plates, the conditioned media were harvested, and aliquots were used for the determination of lactate dehydrogenase activity. The cell layers were washed with CMF-PBS, fixed with methanol, and stained with Giemsa for morphological observations. After a 24-hr incubation of the four cell types described above in 24-well culture plates, the conditioned media were discarded and the cells were incubated with 250 μL of fresh serum-free DMEM and 12.5 μL of AlamarBlue reagent for 2 hr; after that, 200 μL of the supernatant of the media was transferred into a 96-well black-bottom plate. The fluorescence intensity of each sample was measured at 544/590 nm by EnSpire multi plate reader (PerkinElmer, Waltham, MA, USA). Intracellular accumulation of zinc was measured according to the method described in our previous report (Hara et al., 2016). After a 24-hr incubation of vascular endothelial cells described above with zinc sulfate, Zn-06, or Zn-20 (5, 10, and 20 μM) in 6-well culture plates, the media were discarded, and the cells were washed twice with ice-cold CMF-PBS; the cells were then harvested with 1 mL of CMF-PBS. The cell suspensions were centrifuged at 20,000 × g for 3 min and the supernatants were discarded; the pellets were re-suspended in 1.1 mL of CMF-PBS and sonicated to prepare the homogenates. Seven-hundred microliters of the homogenates was ashed in 4.3 mL of 0.1 M nitric acid and used for the detection of intracellular zinc (m/z = 64) by inductively coupled plasma mass spectrometry (NexION300S, PerkinElmer). Another portion of the homogenate (0.3 mL) was analyzed for DNA content by the fluorometric method (Kissane and Robins, 1958) and the zinc contents were expressed as pmol/μg DNA. Statistical analysis was performed using one-way analysis of variance followed by Bonferroni’s-type multiple t-test. Differences between the groups were considered to be significant at **p < 0.01. 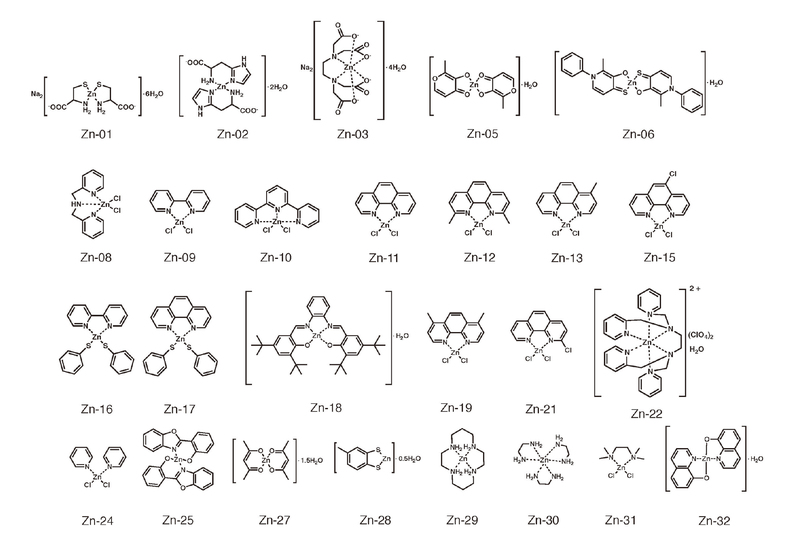 Molecular structures of the twenty-six zinc complexes used in this study are shown in Fig. 1. First, we investigated the cytotoxicity of these zinc complexes in vascular endothelial cells by means of morphological observation and lactate dehydrogenase leakage assay. Morphologically, Zn-06 [bis(1,4-dihydro-2-methyl-1-phenyl-4-thioxo-3-pyridinolato)zinc(II) monohydrate] and Zn-19 [dichloro(4,7-dimethyl-1,10-phenanthroline)zinc(II)] at ≥ 5 µM exhibited cytotoxicity after 24-hr treatment; the cytotoxicity of Zn-06 was stronger than that of Zn-19. The other zinc complexes at ≤ 20 µM were non-toxic (Fig. 2). 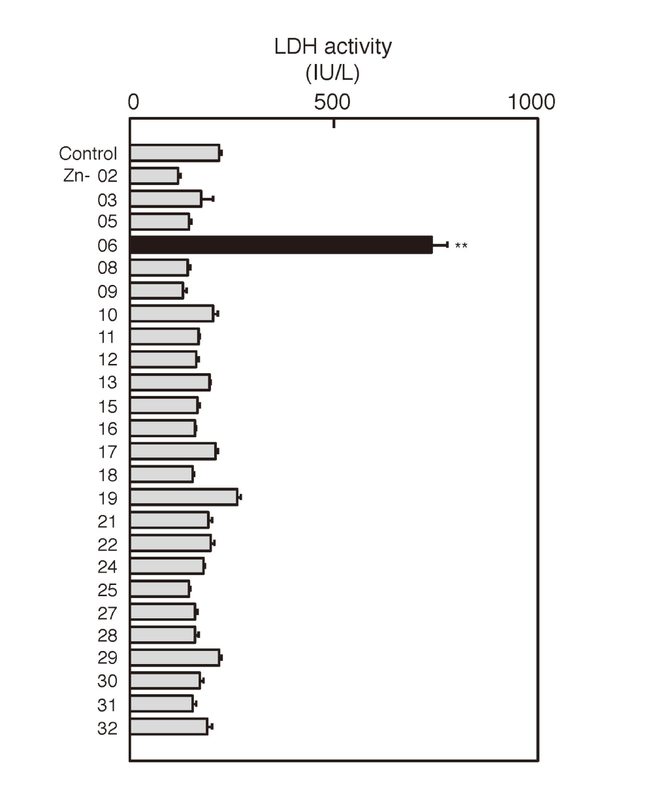 On the other hand, Zn-06 but not Zn-19 significantly increased the leakage of lactate dehydrogenase (Fig. 3), suggesting that Zn-06 exhibits a strong cytotoxicity in vascular endothelial cells. Structures of the zinc complexes used in the present study. Morphological observation of vascular endothelial cells after treatment with zinc. Bovine aortic endothelial cells were treated with zinc complexes (5, 10, and 20 µM each) for 24 hr, and the cell layer was stained with Giemsa. Original magnification (x40). Leakage of lactate dehydrogenase (LDH) into the medium from vascular endothelial cells after treatment with zinc complexes. Bovine aortic endothelial cells were treated with zinc complexes (20 µM each) for 24 hr. Values are means ± SE of four samples. **Significantly different from the control, p < 0.01. Next, we investigated whether Zn-06 would exhibit cytotoxicity in cell types other than vascular endothelial cells or not. As shown in Fig. 4, the morphological evaluation and cell viability experiment showed that Zn-06 at ≥ 5 µM exhibited cytotoxicity in vascular smooth muscle cells, epithelial cells, fibroblastic cells, and vascular endothelial cells in a concentration-dependent manner, suggesting that the cytotoxicity of Zn-06 is independent of the cell type. Cytotoxicity of Zn-06 in vascular endothelial cells, vascular smooth muscle cells, renal epithelial cells, and fibroblastic cells. Bovine aortic endothelial cells (A), bovine aortic smooth muscle cells (B), porcine kidney epithelial LLC-PK1 cells (C), and human fetal fibroblastic IMR-90 cells (D) were treated with Zn-06 (1, 5, 10, and 20 µM) for 24 hr. After treatment, the cell layer was stained with Giemsa and cell viability was measured by AlamarBlue assay. Original magnification (x40). Values are means ± SE of four samples. Significantly different from the corresponding control, *p < 0.05; *p < 0.01. It is possible that the cytotoxicity of Zn-06 is attributable to that of the ligand structure. To examine this possibility, the cytotoxicity of 3-hydroxy-2-methyl-1-phenylpyridin-4(1H)-thione, the ligand of Zn-06, in vascular endothelial cells was investigated by means of morphological observation and cell viability experiment. The ligand of Zn-06 as well as inorganic zinc sulfate failed to exhibit cytotoxicity, although the cytotoxicity of Zn-06 was observed (Fig. 5). This suggests that the cytotoxicity of Zn-06 requires the whole structure of the zinc complex, that is, the formation of a complex of zinc atom with 3-hydroxy-2-methyl-1-phenylpyridin-4(1H)-thione as the ligand. Cytotoxicity of zinc sulfate and the ligand of Zn-06 in vascular endothelial cells. Bovine aortic endothelial cells were treated with zinc sulfate (1, 5, 10, and 20 µM) or 3-hydroxy-2-methyl-1-phenylpyridin-4(1H)-thione, the ligand of Zn-06 (2, 10, 20, and 40 µM) for 24 hr. After treatment, the cell layer was stained with Giemsa and cell viability was measured by AlamarBlue assay. Original magnification (x40). Values are means ± SE of four samples. **Significantly different from the corresponding control at p < 0.01. The structure-activity relationship of Zn-06 cytotoxicity in vascular endothelial cells was investigated (Fig. 6). The cytotoxicity of Zn-20 (Fig. 6A), an analog of Zn-06 in which the sulfur atoms are replaced with oxygen atoms, was not observed in vascular endothelial cells (Fig. 6B, left panels). Additionally, Zn-33[bis(2-furanmethanethiolato)zinc(II)] having a tetracoordinate structure containing 3-hydroxy oxygen atoms and 4-thione sulfur atoms with zinc, was also non-toxic in vascular endothelial cells (Fig. 6B, right panels). 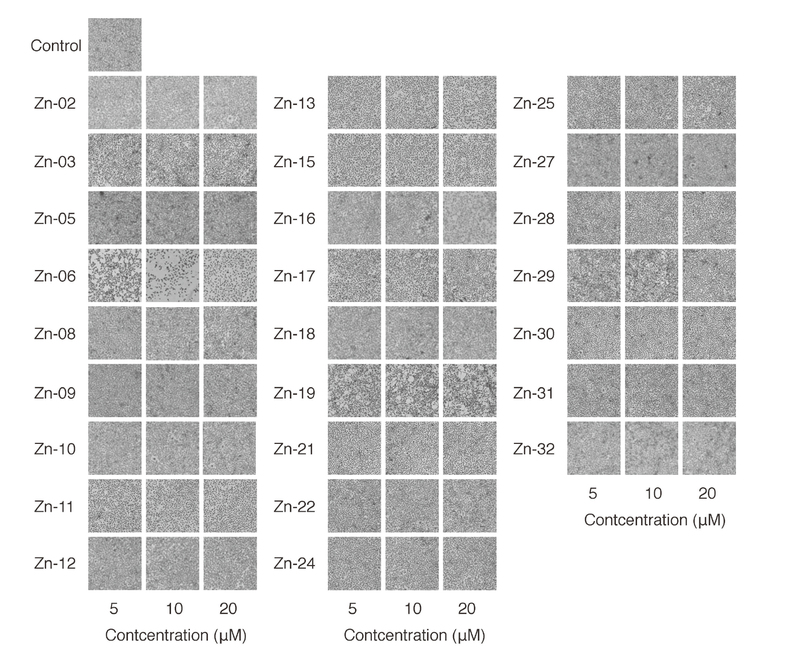 The measurement of intracellular accumulation of zinc after treatment of vascular endothelial cells with zinc sulfate, Zn-06, and Zn-20 in vascular endothelial cells (Fig. 7) revealed that only Zn-06 can significantly accumulate in cells. This indicates that the tetracoordinate structure of Zn-06, which contains two sulfur and two oxygen atoms, attached to zinc may be important for the accumulation of Zn-06 in vascular endothelial cells. These results suggest that the tetracoordinate structure of Zn-06 molecule facilitates its accumulation within cells whereas the whole structure of the zinc complex including the structure of 3-hydroxy-2-methyl-1-phenylpyridin-4(1H)-thione is involved in its cytotoxicity in cells. Cytotoxicity of Zn-20 and Zn-33 in vascular endothelial cells. Bovine aortic endothelial cells were treated with Zn-20 or Zn-33 (1, 5, 10, and 20 µM) for 24 hr. After treatment, the cell layer was stained with Giemsa and cell viability was measured by AlamarBlue assay. Original magnification (x40). Values are means ± SE of four samples. **Significantly different from the corresponding control, p < 0.01. Accumulation of zinc sulfate, Zn-06, and Zn-20 in vascular endothelial cells. Bovine aortic endothelial cells were treated with zinc sulfate, Zn-06, and Zn-20 (5, 10, and 20 µM) for 24 hr. After treatment, the intracellular accumulation of zinc was measured by ICP-MS. Values are means ± SE of four samples. **Significantly different from the corresponding control, p < 0.01. Zinc is a trace element that is required for the conformations and activities of many proteins and has a variety of roles in the mammalian system (Burch et al., 1975). It is believed that zinc complexes are in general non-toxic or only slightly toxic because inorganic zinc is non-toxic. However, organic-inorganic hybrid molecules, including zinc complexes, can exhibit distinct biological activities from that of the intramolecular metal in inorganic forms (Fujie et al., 2016a). The biological activities, including cytotoxicity, of either the molecular structures or that of the metals that make up the hybrid molecules cannot be used to predict the biological activities of such hybrid molecules (Kohri et al., 2015; Murakami et al., 2015; Hara et al., 2016; Nakamura et al., 2017). The present study demonstrated that Zn-06 could significantly accumulate within various cell types and exhibited cytotoxicity in cells.. Although inorganic zinc is non-toxic to vascular endothelial cells (Kaji et al., 1992), this study showed that zinc in organic forms could be cytotoxic. Moreover, the cytotoxicity can be exhibited in various cell types other than vascular endothelial cells. Zn-06 is a zinc complex synthesized by Katoh et al. (2002) for the first time and shown to exhibit an insulin-mimetic activity as evaluated by the inhibitory activity on the release of free fatty acid from cultured rat adipocytes stimulated by insulin. The present data suggest that cytotoxicity of Zn-06 may contribute to the mechanisms underlying this biological activity. The present study revealed two functions of the ligand structure of Zn-06 in the cytotoxicity of the zinc complex in vascular endothelial cells. One was the facilitation of Zn-06 entry into cells, which required the tetracoordinate structure containing 3-hydroxy oxygen atoms and 4-thione sulfur atoms. The other was the involvement in the cytotoxic activity, which required the whole structure of Zn-06 including the heterocyclic 1,4-dihydropyridine rings. In other words, the present data indicate that the ligand of cytotoxic zinc complexes has at least two functions—to accelerate the intracellular accumulation and to facilitate the cytotoxicity of the zinc complexes. It is likely that electronic fluctuation or imbalance between the 3-hydroxy oxygen atoms and 4-thione sulfur atoms, which is due to the flexibility of the π electron of the double bond between 3-carbon and 4-carbon in the heterocyclic 1,4-dihydropyridine rings, may be involved in the cytotoxicity of Zn-06. This is partly supported by a previous study, which showed that insulin-like activity of di(2-mercaptopyridine-N-oxidato)zinc(II) is higher than that of di(2-hydroxypyridine-N-oxidato)zinc(II) in rat epididymal adipocytes (Fujimoto et al., 2013). The relationship between the biological activity and structure of organic-inorganic hybrid molecules is not simple; the present data indicate that the structure of the ligand or intracellular interaction between the ligand and intramolecular metal may be important for the biological activity of organic-inorganic hybrid molecules. It is possible that a part of the ligand structure may have plural parts to accumulate within the cells and to exhibit biological activities. Although inorganic zinc is one of the typical inducers of metallothionein, a cytoprotective protein against heavy metal toxicity, it cannot induce metallothionein in vascular endothelial cells (Kaji et al., 1992; Fujie et al., 2016c). We have demonstrated that copper(II)bis(diethyldithiocarbamate) induces metallothionein (Fujie et al., 2016b) via activation of two transcription factors—MTF-1 (Radtke et al., 1993; Zhang et al., 2001) and Nrf2 (Itoh et al., 1997) in vascular endothelial cells. In our preliminary experiments, Zn-06 also induced metallothionein with activation of Nrf2 in vascular endothelial cells (data not shown). Zn-06 may be a good tool to analyze the structure-activity relationship of organic-inorganic hybrid molecules with respect to the regulation of defense mechanisms against heavy metal toxicity as well as cytotoxicity in vascular endothelial cells. Clarification of the structure-activity relationship of organic-inorganic hybrid molecules with respect to their biological activities is important for understanding bio-organometallics. In the present study, it was suggested that the ligand of cytotoxic zinc complexes has structures responsible for the accumulation of the zinc complexes and exhibition of the cytotoxicity in vascular endothelial cells. The present and previous studies support the hypothesis that bio-organometallics is an excellent strategy to analyze biological systems and to evaluate the toxicity of organic-inorganic hybrid molecules. This work was supported by JSPS KAKENHI as follows: Grant-in-Aids for Challenging Exploratory Research JP15K14992 (to T. K.) and a Grant-in-Aid for Scientific Research (C) JP15K08047 (to C.Y.). Burch, R.E., Hahn, H.K. and Sullivan, J.F. (1975): Newer aspects of the roles of zinc, manganese, and copper in human nutrition. Clin. Chem., 21, 501-520. Fujie, T., Hara, T. and Kaji, T. (2016a): Toxicology of organic-inorganic hybrid molecules: bio-organometallics and its toxicology. J. Toxicol. Sci., 41 (Special), SP81-SP88. Fujie, T., Segawa, Y., Uehara, A., Nakamura, T., Kimura, T., Yoshida, E., Yamamoto, C., Uchiyama, M., Naka, H. and Kaji, T. (2016c): Zinc diethyldithiocarbamate as an inducer of metallothionein in cultured vascular endothelial cells. J. Toxicol. Sci., 41, 217-224. Fujie, T., Segawa, Y., Yoshida, E., Kimura, T., Fujiwara, Y., Yamamoto, C., Satoh, M., Naka, H. and Kaji, T. (2016b): Induction of metallothionein isoforms by copper diethyldithiocarbamate in cultured vascular endothelial cells. J. Toxicol. Sci., 41, 225-232. Fujimoto, S., Yasui, H. and Yoshikawa, Y. (2013): Development of a novel antidiabetic zinc complex with an organoselenium ligand at the lowest dosage in KK-Ay mice. J. Inorg. Biochem., 121, 10-15.
de Groot, P.G., Gonsalves, M.D., Loesberg, C., van Buul-Wortelboer, M.F., van Aken, W.G. and van Mourik, J.A. (1984): Thrombin-induced release of von Willebrand factor from endothelial cells is mediated by phospholipid methylation. Prostacyclin synthesis is independent of phospholipid methylation. J. Biol. Chem., 259, 13329-13333. Hara, T., Kojima, T., Matsuzaki, H., Nakamura, T., Yoshida, E., Fujiwara, Y., Yamamoto, C., Saito, S. and Kaji, T. (2017): Induction of syndecan-4 by organic-inorganic hybrid molecules with a 1,10-phenanthroline structure in cultured vascular endothelial cells. Int. J. Mol. Sci., 18, 352. Hara, T., Matsuzaki, H., Nakamura, T., Yoshida, E., Ohkubo, T., Maruyama, H., Yamamoto, C., Saito, S. and Kaji, T. (2016): Cytotoxicity of zinc, copper and rhodium complexes with 1,10-phenanthroline or 2,9-dimethyl-1,10-phenanthroline in cultured vascular endothelial cells. Fundam. Toxicol. Sci., 3, 109-113. Hara, T., Nonaka, Y., Yasuike, S., Kaji, T. and Yamamoto, C. (2018): Structure-activity relationship of [1,5]azastibocines in cytotoxicity to vascular endothelial cells. J. Toxicol. Sci., 43, 735-740. Itoh, K., Chiba, T., Takahashi, S., Ishii, T., Igarashi, K., Katoh, Y., Oyake, T., Hayashi, N., Satoh, K., Hatayama, I., Yamamoto, M. and Nabeshima, Y. (1997): An Nrf2/small Maf heterodimer mediates the induction of phase II detoxifying enzyme genes through antioxidant response elements. Biochem. Biophys. Res. Commun., 236, 313-322. Kaji, T., Fujiwara, Y., Sakurai, S., Yamamoto, C., Kozuka, H. and Koizumi, F. (1995): Zinc promotes the repair of wounded monolayers of cultured vascular endothelial cells. Res. Commun. Mol. Pathol. Pharmacol., 89, 189-198. Kaji, T., Fujiwara, Y., Yamamoto, C., Sakamoto, M. and Kozuka, H. (1994): Stimulation by zinc of cultured vascular endothelial cell proliferation: possible involvement of endogenous basic fibroblast growth factor. Life Sci., 55, 1781-1787. Kaji, T., Mishima, A., Koyanagi, E., Yamamoto, C., Sakamoto, M. and Kozuka, H. (1992): Possible mechanism for zinc protection against cadmium cytotoxicity in cultured vascular endothelial cells. Toxicology, 76, 257-270. Katoh, A., Tsukahara, T., Saito, R., Ghosh, K.K., Yoshikawa, Y., Kojima, Y., Tamura, A. and Sakurai, H. (2002): An extremely high insulin-mimetic activity of bis(1,4-dihydro-2-methyl-1-phenyl-4-thioxo-3-pyridinolato)zinc(II) complex. Chem. Lett., 31, 114-115. Kissane, J.M. and Robins, E. (1958): The fluorometric measurement of deoxyribonucleic acid in animal tissues with special reference to the central nervous system. J. Biol. Chem., 233, 184-188. Kohri, K., Yoshida, E., Yasuike, S., Fujie, T., Yamamoto, C. and Kaji, T. (2015): The cytotoxicity of organobismuth compounds with certain molecular structures can be diminished by replacing the bismuth atom with an antimony atom in the molecules. J. Toxicol. Sci., 40, 321-327. Levin, E.G. and Loskutoff, D.J. (1982): Regulation of plasminogen activator production by cultured endothelial cells. Ann. N. Y. Acad. Sci., 401, 184-194. Marcum, J.A., Atha, D.H., Fritze, L.M., Nawroth, P., Stern, D. and Rosenberg, R.D. (1986): Cloned bovine aortic endothelial cells synthesize anticoagulantly active heparan sulfate proteoglycan. J. Biol. Chem., 261, 7507-7517. Matsuoka, I., Nakahata, N. and Nakanishi, H. (1989): Inhibitory effect of 8-bromo cyclic GMP on an extracellular Ca2+-dependent arachidonic acid liberation in collagen-stimulated rabbit platelets. Biochem. Pharmacol., 38, 1841-1847.
van Mourik, J.A., Lawrence, D.A. and Loskutoff, D.J. (1984): Purification of an inhibitor of plasminogen activator (antiactivator) synthesized by endothelial cells. J. Biol. Chem., 259, 14914-14921. Murakami, M., Fujie, T., Matsumura, M., Yoshida, E., Yamamoto, C., Fujiwara, Y., Yasuike, S. and Kaji, T. (2015): Comparative cytotoxicity of triphenylstibane and fluorine-substituted triarylpnictogens in cultured vascular endothelial cells. Fundam. Toxicol. Sci., 2, 61-66. Nakamura, T., Yoshida, E., Fujie, T., Ogata, F., Yamamoto, C., Kawasaki, N. and Kaji, T. (2017): Synergistic cytotoxicity caused by forming a complex of copper and 2,9-dimethyl-1,10-phenanthroline in cultured vascular endothelial cells. J. Toxicol. Sci., 42, 683-687. Radtke, F., Heuchel, R., Georgiev, O., Hergersberg, M., Gariglio, M., Dembic, Z. and Schaffner, W. (1993): Cloned transcription factor MTF-1 activates the mouse metallothionein I promoter. EMBO J., 12, 1355-1362. Revtyak, G.E., Johnson, A.R. and Campbell, W.B. (1987): Prostaglandin synthesis in bovine coronary endothelial cells: comparison with other commonly studied endothelial cells. Thromb. Res., 48, 671-683. Sato, Y. and Rifkin, D.B. (1988): Autocrine activities of basic fibroblast growth factor: regulation of endothelial cell movement, plasminogen activator synthesis, and DNA synthesis. J. Cell Biol., 107, 1199-1205. Zhang, B., Egli, D., Georgiev, O. and Schaffner, W. (2001): The Drosophila homolog of mammalian zinc finger factor MTF-1 activates transcription in response to heavy metals. Mol. Cell. Biol., 21, 4505-4514.